Unlock a network of new connections. and cultivate a new customer base to build new revenue-generating opportunities. Your business is searchable in a directory of over 15,000 funeral service providers. 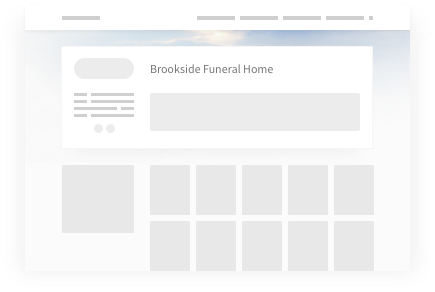 Make your funeral home stand out by taking ownership of the microsite. Highlight your business with a customized microsite. Build a brand image that shows customers what sets your funeral home apart. We're keeping track. Get an edge on the competition with free access to analytics tools that track customer views, leads and traffic. In order to proceed, you must agree to the Terms and Conditions. I acknowledge that I am an authorized representative of this funeral home and agree to Terms and conditions.